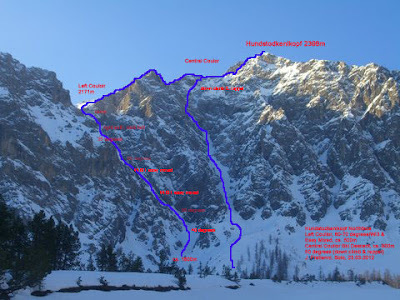 I completed a long-standing project of mine in a back corner of the Wimbachgries (Wimbach drainage) at the end of March: linking the left and central couloirs of the Hundstodkenlkopf north face. I wanted to climb up the left couloir, traverse over to the Hundstodkenlkopf peak, down climb and rappel into the central couloir and ski the remainder of the decent. All the factors alined themselves at the end of March this year: conditions, time, motivation and the proper frame of mind. The approach to the entrance of the left couloir is 1000 meters of elevation gain and about 9 kilometers. There is an additional 200 meters of steep switchbacks before the actual climbing begins. At about 1800 meters, there is a short ice section (WI3) that leads to easy mixed terrain. It was fun and relatively easy to climb as the snow and ice conditions were very good. Getting into the narrowest part of the couloir was cramped with the skis on my pack. Nevertheless I felt secure and didn't need to set up any kind of self-belay system. After climbing the ice and mixed ground the couloir was filled with steep hard snow for 250 meters or so. The next ice step was easy. This led to a relatively flatter section of thirty-five to forty degrees which ended at an easy mixed ramp. I exited the first couloir at about 11:00. It was the first sunshine of the day. To This point I needed six and one-half hours to cover the ca. 1200 meters of skinning and 350 meters of climbing. After getting out of the first couloir, there was 200 meters or so of skinning up to he Hundstodkenlkopf peak. The snow was 10cm of cold powder on a crust which made the last bit to the top quite tedious. The next part of the link-up was the crux: finding the right entrance into the central couloir. I had been in the central couloir on two previous occasions. The second time I was in the central couloir I had gone up as far as possible with skis and then made the first ski descent two seasons prior. At just under the Hundstodkenlkopf peak, I chose to down climb a snow ramp that transformed into a steep gully. The conditions in the gully system were nerve-wracking; cold powder on friable, loose rock. By a combination of down climbing and rappelling I could eventually get to a point were I could put on my skis and start skiing down. Despite not seeing any evidence of instability, I was nervous and just wanted to ski down safely and securely. I didn't take any more photos because I didn't want to take any more time than absolutely necessary. The ski descent went really well. The snow pack was very stable and actually great to ski. The pictures are from my first time in the couloir and give an accurate impression of the descent's ambiance. Skiing out of the drainage was fast and pleasant. I could get to about 750 meters before the snow ran out and I had to put my skis over my shoulder for the remainder of the walk out.